← How to Trim MP4 Files on Mac OS X El Capitan? In order to save space of computer, MP3 Player or portable devices like iPhone and iPad, thousands of people dig around the web to see if they could find out a best fit tool to compress MP3 files to reduce MP3 files size. What’s a best fit solution? Some people hope that the tool can compress MP3 audio without re-encoding. But to others’, it is just the other way around. They do not only want to compress MP3 music, but also desire to save the compressed MP3 file to other audio formats. And some very care about the quality of the compressed MP3 clip. Well, if you are a regular user of MP3 files you need not to be described about the benefits to compress MP3 files. On the other hand, if you have no idea about the advantages of keeping your audio files in the MP3 format. 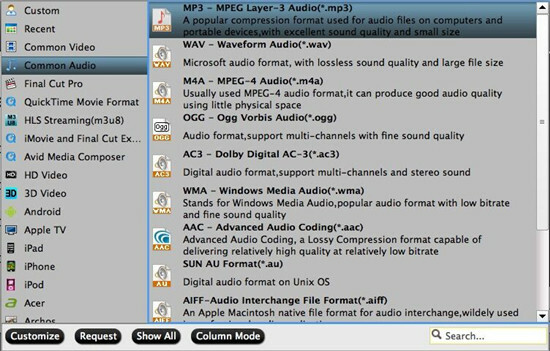 Here is the list of advantages of MP3 file and compressing them. 1.Easy assistance- you can experience an amazing fun and ease to operate the audio file in the form of MP3 format. It’s really a lovable format that it assists you providing good quality of audio. 2.Storage of less hard drive- it is an easy task to compress MP3 files with the help of Mac MP3 compressor. You can save more files in less space when you compress files with reasonable settings. There are lots of good software to offer you the facility to compress MP3 files on Mac OS X El Capitan. Pavtube Video Converter for Mac (review) is one of the efficient tool that allows you the facility of not only compressing the video and audio files but also to convert the format of a file in the desired way. It has been designed exclusively for working in the direction of easy and simple file compression activity. You can’t even imagine how much it can help you to compress MP3 on your Mac OS X El Capitan. Step 1: Free download the professional Mac MP3 compressor, install and run it, the following interface will pop up. Click “Add Video” button to load MP3 audio files which you want to compress. Or simply drop your files into this program. Step 2: Select different compression methods. (1)Choose a codec with higher compression ratio. This method is effective, but will reduce audio quality apparently. (2)Adjust MP3 audio settings: If you want to keep MP3 format, you can select “Common Audio>>MP3- MPEG Layer-3 Audio (*.mp3)” and open the settings window by clicking “Settings”. You are required to choose a lower bit rate. According to our experience, MP3 files with 128 kbps bit rate can save nearly 1 MB per 5 MB song without any major decrease in quality after decreasing the bit rate to around 90 kbps. Step 3: Click the “Convert” button to start compressing MP3 on Mac OS X El Capitan with previous settings. Conclusion: The rest will be finished automatically by this Mac MP3 compressor. It won’t take a long time because fast speed is one of its features.